Are you a coffee or tea person? I am definitely a tea person. I love one cup of coffee in the morning but after that, I strictly drink tea. I even set aside time during my day, every day, to sit quietly and have a cup of tea. It is time well spent and keeps me grounded. It allows me to unwind and just be. There are so many ways to celebrate your favorite cup of tea. Below is a sampling of the best and cutest tea inspired cross stitch patterns from around the internet. As I said above, every day I make time to sit back and enjoy a cup of tea. It is literally my favorite time of the day. Nothing is better than having a warm cup of tea and relax from the daily grind. 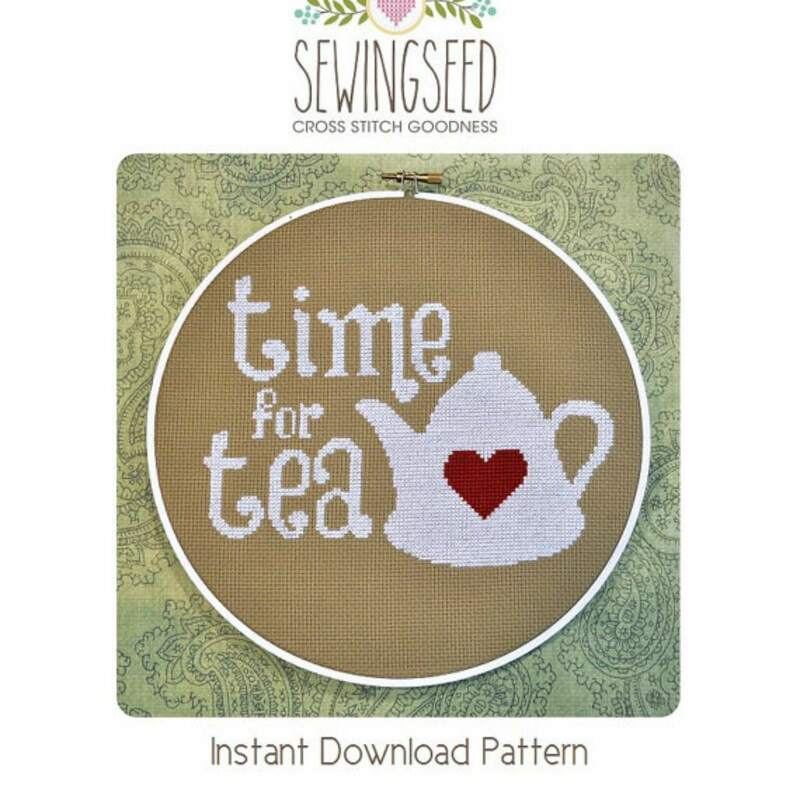 Sewing Seeds created this simple yet beautiful Time for Tea cross stitch pattern. It would be perfect in a little kitchen. Fix up a tea station and have this cross stitch pattern hanging on the wall. It would also be super cute in an office as a reminder to take time for yourself. You can see this pattern as well as other adorable patterns HERE. Doesn't it seem like cats and tea go together? Maybe because they both are so relaxed. A snuggling kitty, a good book and a cup of teat equals heaven! It is bliss! I would even add a rainy day into the mix. This pattern from the Daily Cross Stitch is purrfect for the cat lover who also desires a good cup of tea. The Daily Cross Stitch is a great site that has a free pattern each day, after that the patterns range in price but are never more than a few dollars. Sign up to get their emails and get free patterns. You can read more about their plans and check out this pattern HERE. You know who enjoys a cup of tea? Dinosaurs! Yep! It is true! They are a lot fancier than we give them credit for. They love high tea! They put on fancy hats and enjoy tea and cakes. Okay, so maybe they aren't that fancy, but we can wish. StitchLine created this fun take on the infamous T-Rex. This dino loves his tea and isn't afraid to show it. Would you tell a T-Rex that drinking tea isn't allowed? Me neither! You can find all sorts of fun pattern at the Esty Shop. They are even having a BOGO sale right now. Check it out HERE. Are you ready to PAR-TEA? Yahoo! Ain't no party like hanging out in your pj's, watching a movie and having a cup of tea. Sounds like my kind of Friday night! Cup of Tea Creative creates this pattern that is a fun play on words. How can you not be happy when you have a cup of a tea and a balloon? Check out the pattern HERE. There is only one being that is more fancy about their tea than the T-Rex and that is Mr. T. Don't shake your head! He is all about super fancy tea parties! He is a fan of taking his tea in the afternoon. It relaxes him after a long day. Amy P Campbell has created a pattern for Mr. Afternoon Tea. I pity the fool that don't buy this pattern! Grab your gold chains, your favorite tea cup and stitch this A team pattern up! You can check out this pattern and so many more at the store front. Be warned that some of them are adult themed. You can see the patterns HERE. Whether you enjoy a nice hot cup or a tall iced glass, tea is the best thing out there. It relaxes and refreshes you. It is the perfect companion to your stitching projects. The cross stitch patterns listed are a perfect way to let the world know that a cup of tea is just right for you and me!